Scheuermann’s Kyphosis, also known as Scheuermann’s Disease is a condition affecting the vertebral growth plates of the spine. 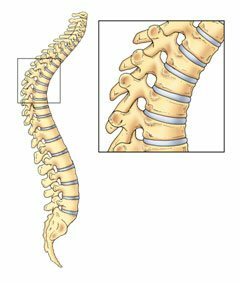 Typically it is seen in the lower or mid-thoracic spine and must affect 3 adjacent vertebrae. It usually presents during the adolescent growth spurt and can lead to the affected vertebrae growing into a slight wedge-shape which is easy to see when viewed on x-ray from the side. In Scheurmann’s, the vertebrae are slightly shorter in height at the front than at the back. This leads to a forward hunching curve in the spine. As the vertebral body deteriorates, the disc between the vertebra can make small protrusions into the vertebral end-plate above and below and is called a Schmorl’s node. The condition can progress during the growing year, but will cease when growth is complete. Classically the affected spine is very stiff, especially into backward bending and twisting. The increased kyphosis is most noticeable when the patient bends forward to touch their toes and an acute visible hump can be seen from the side view. Unfortunately Scheuermann’s condition is frequently painful and can be restrictive for the individual, who may need to curb activities and sports to keep symptoms to a manageable level. Treatment for Scheuermann’s kyphosis typically includes specific hands on chiropractic treatment to help alleviate any specific pain and stiffness in the back, combined with exercises to extend the trunk and stretch the front of the chest while balancing the overall posture. With chiropractic biophysics treatment, a unique protocol is followed to improve the posture. It involves teaching Mirror Image exercises where a patient, shifts their posture into the complete opposite direction of their hyperkyphosis, the spine is then adjusted in the same corrective direction and tractioned/stretched into the same position. In many cases, the condition can cause trouble spots around the hips or rib cage, who’s natural range of movement can often be impinged upon by the kyphotic curve – the above approaches can be effective in reducing this effect. Bracing is typically recommended when a Kyphosis progresses beyond 60 degrees as there is a tendency for the curve to continue to worsen even after growth has finished. Surgery is often recommended if the curve is greater than 70 degrees. Old fashioned braces used to be the only way to non-surgically treat kyphosis. The development of specialised kyphosis like Kyphobrace braces however, means there is now another bracing treatment option for kyphosis in teens and young adults that aims to not only hold but also reduce the kyphosis and is low profile and hardly visible under clothing.